Second, make healthy eating part of your holiday traditions. In Grillin the Road, there are great, healthy recipes for a complete holiday meal that is not only healthy, but tasty. Even desserts and cranberry relish! So, for the start of this lovely holiday season, I would like to share a couple of links that are extremely important to our health. They concern Genetically Modified Organisms (GMO) foods that we must stop eating in order to be healthy. I am convinced, by personal experience of both myself and my daughter, that poisoning our bodies with unhealthy foods leads to bad health. It's been proven. Let us not be ignorant and/or lazy. Let us educate ourselves and advance in intelligence to be healthy. Much of the increased healthcare needs, costs, and what has lead to President Obama creating a nationwide heathcare initiative greatly stems from the grossly increasing health issues that CAN be prevented and even treated by proper nutrition. While there are genuine healthcare needs that should be addressed, and genuine poverty issues that cause for intervention for help, there is much that can be helped with just educating ourselves to healthy eating. Not only are we making ourselves sick and causing/exacerbating diseases within our bodies, we are changing our DNA, our genetic makeup, and passing those altered genes on to our children. 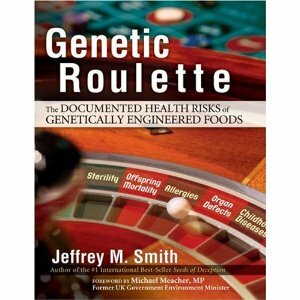 It shows how the government, and primarily the FDA, is not allowing the public to know the dangers of GMO foods because key politicians and directors, scientists and other figures are controlled and an inherent part of such companies that promote the substance. Yes, I speak out without fear against such because I know, first hand, the dangers of what they are promoting. Why do they promote their products? Because, as a big business, they wish to increase their business and make money. That is the bottom line. They are not concerned with the health of America. They are concerned with capital growth. Period.